After the successes of 2009, it was remarkable that 2010 would prove to be an even more successful season. The successes fall into two categories: Firstly, the bee itself. Strong consolidation in known areas, with many repeat observations, and on top of that, we have seen the long-awaited expansion westward, with records across south Wales and into the south-west peninsula, as far as eastern Cornwall. Secondly, the response of the BWARS membership, and the public at large have swelled the number of records this year to a staggering 670. As I write, I still await records from many stalwarts, several local Recording Schemes, and from our collaborators at the Bumblebee Conservation Trust. This year we have made available our first full Information Sheet on Bombus hypnorum, and I am know that there have been many downloads from the BWARS website and from other sites which have made this available. In 2011, we will also have a Welsh language version of the sheet available, thanks to one of our collaborators in Wales. From our 670 records, the number of occupied grid cells has grown from 200 to 336 (a 68% increase) this year. Only about 50% of all the cells from which we received data up to the end of 2009 had no repeat records this year. Evidence suggests that the season was running about two weeks behind 2009, and this may have been responsible for the decrease in the number of second brood workers and males being seen in August. Many areas have had staggering numbers of individuals this year, with peak activity falling in the second week in June. On a one hour walk on a transect around suburban Salisbury, I saw no less than 100 individuals, mostly at flowers of Bramble. Other highlights include a swathe of records from across south Wales, from Monmouthshire west to Pembroke, with a hot spot in Carmarthenshire. 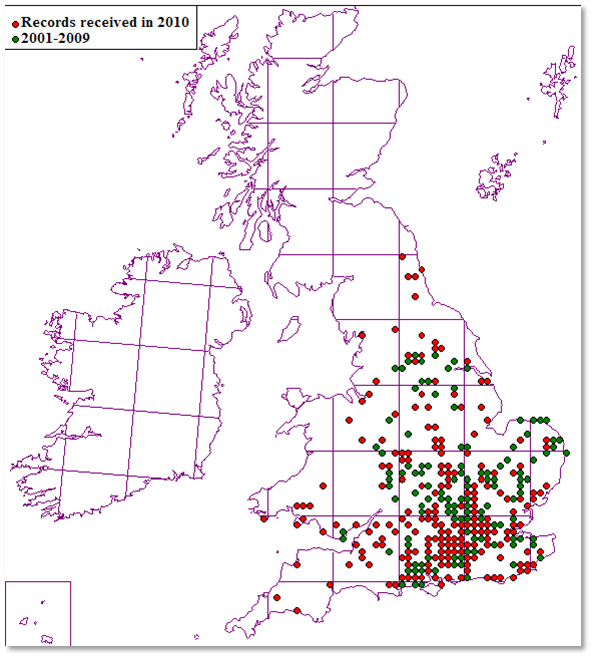 Add to this a huge increase in numbers of sightings from Adam Bates’s OPAL teams in Birmingham, and many records from in and around Leicester, Leeds and Tyneside as well. We have also received a large number of reports coming in of active nests in bird, bat and Dormouse boxes, and we are grateful to the BTO, Bat Conservation Trust and the Mammal Society members who have sent in their data to us. Indeed, we are indebted to our active and dedicated membership and all the many naturalists from a myriad of disciplines who have sent in data to our scheme this summer. The system for monitoring B. hypnorum in UK was presented to a large audience of US biologists at an 4 day international conference at Penn State University in Pennsylvania, USA in late July. There is a lot of enthusiasm in the US for attempting a similar approach to ours, and this, along with other monitoring protocols, will be studied at a conference at St. Louis zoo in November. Stuart Roberts 2010. Back to Survey.